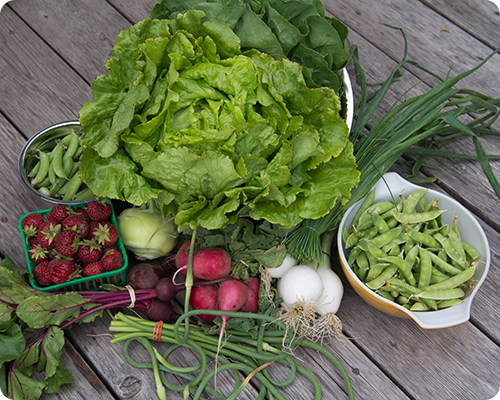 Our produce box was very full this week: snap peas, chives, garlic scapes, oregano, strawberries, beet tops, snow peas, kohlrabi, onions, romaine lettuce, nevada lettuce, radishes.....a very bountiful box indeed. Mixed Green Salad (Romaine and Nevada lettuce) with Beet Tops - my own creation, topped with green onions and chives, and dressed with olive oil, salt and pepper. 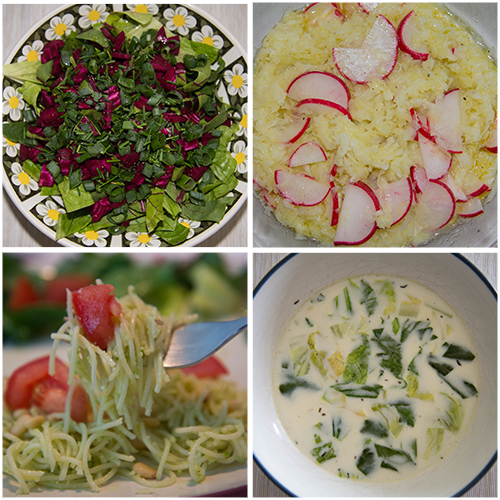 Kohlrabi and Radish Salad - recipe courtesy of this week's box. While it does not look like much, it was very good, so good that the girls asked for second helpings. Garlic Scape Pesto - we got this recipe in last year's box and loved it so much that we were eagerly hoping for more scapes to come our way this year so that we could make it again. We add this pesto to angel hair pasta and top it with fresh tomatoes and pine nuts; it is absolutely delicious. Lettuce Soup - an unusual recipe that came with this week's box. I thought I would give it a try as a means to use up some of the lettuce. I also repeated a few recipes from last week: Pea Stir-Fry with Mushrooms and Almonds and Cucumber and Strawberry Salad with Snap Peas. And with all that lettuce on hand, we had salad every day. I used the chives to make a Honey Chive Dressing; the recipe (from The Forest Feast) makes quite a bit and I simply stored it in a mason jar in the fridge and pulled it out throughout the week to dress our salads as needed - very handy indeed. Everything tastes so much better when it is fresh from the garden. Needless to say, we are eating very well around here.